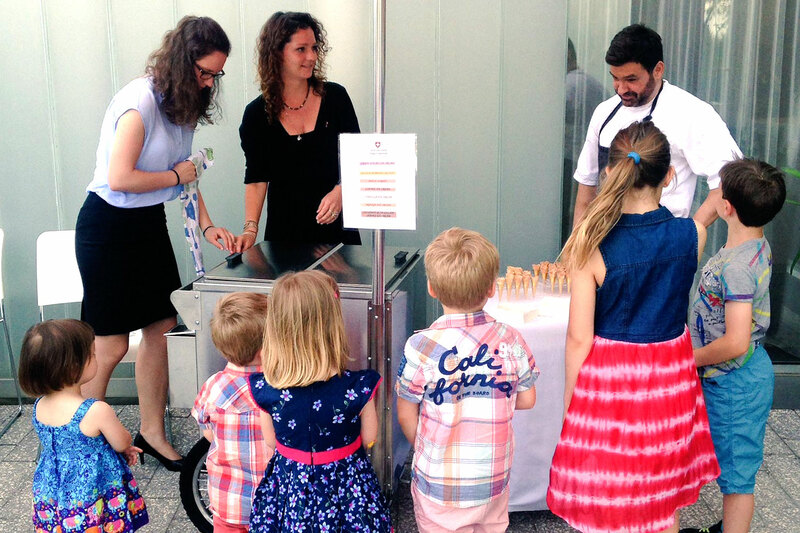 Proven by the Ambassador’s very popular ice cream cart: food is not only important when it comes to diplomacy. 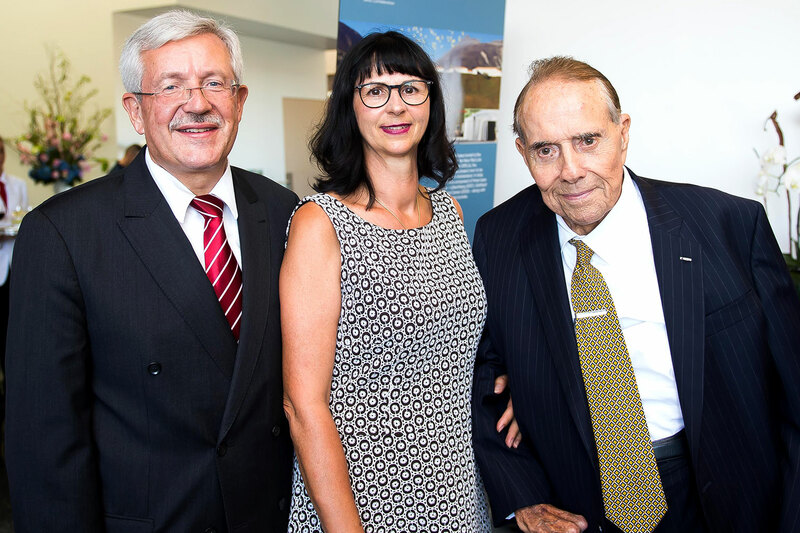 Former Senator Bob Dole came to celebrate the 2016 Soirée Suisse. 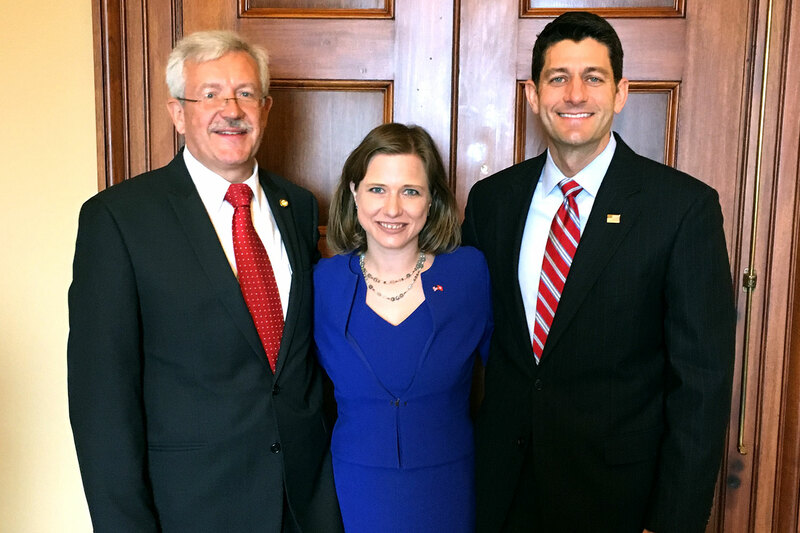 Ambassador Dahinden and Christa Markwalder, President of the Swiss National Council, met with Speaker of the House Paul Ryan. 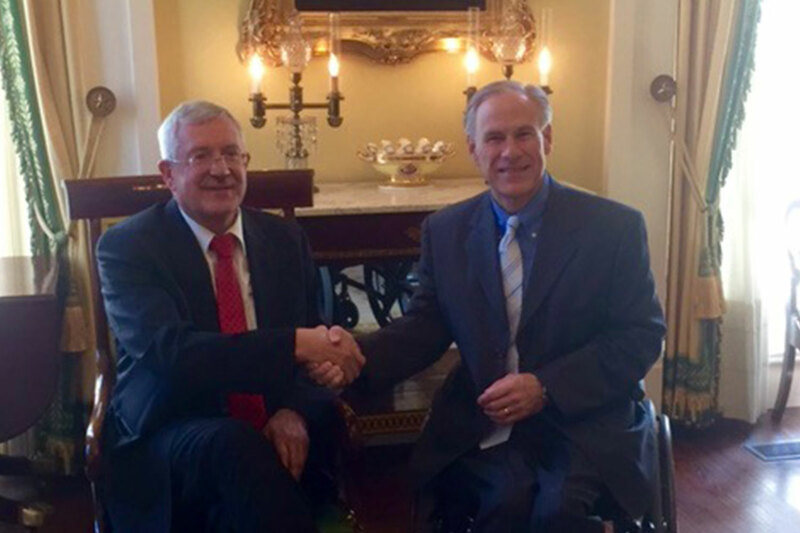 The Ambassador met Governor Greg Abbott in Austin, Texas. 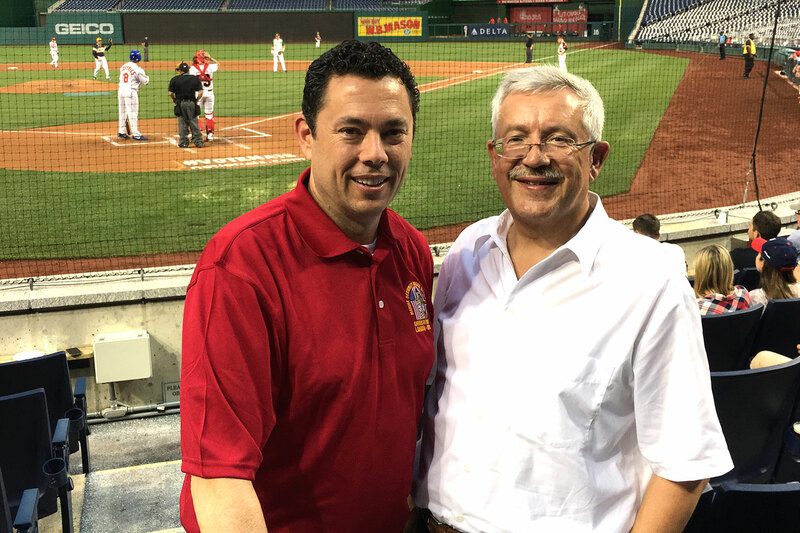 Ambassador Dahinden together with Representative Jason Chaffetz at the Congressional Baseball game in Washington D.C. The Republicans ended a 7-year losing streak by winning the game 8-7. 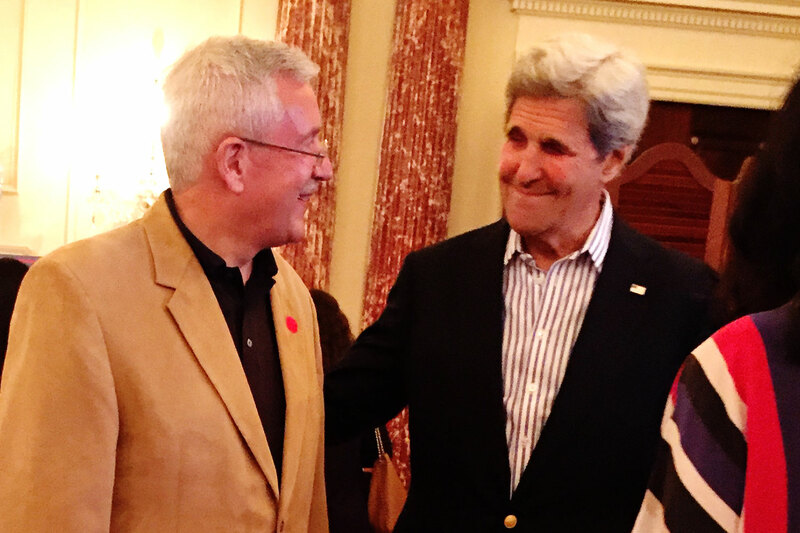 Ambassador Martin Dahinden with United States Secretary of State John Kerry. 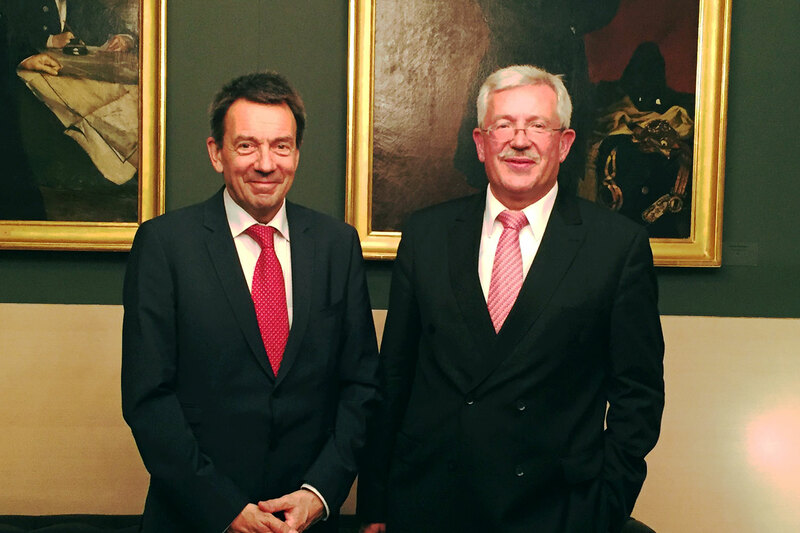 Ambassador Dahinden with Peter Maurer, President of the ICRC. 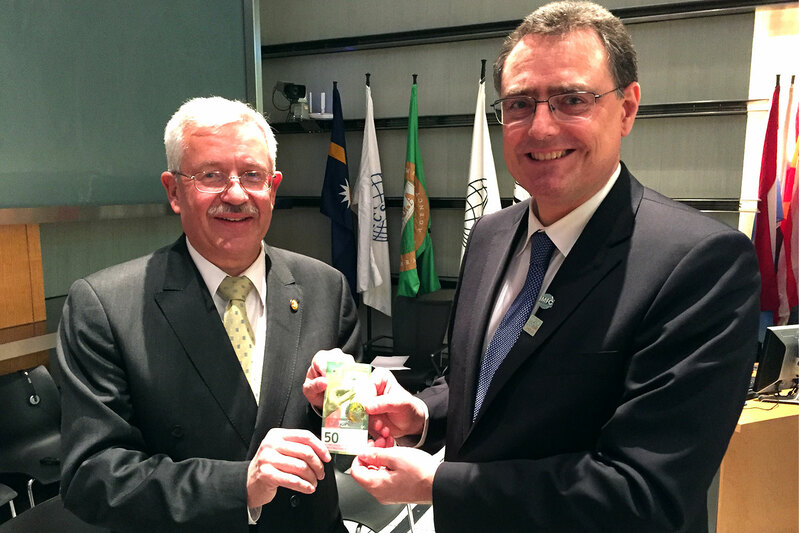 On the occasion of his visit at the annual Worldbank/IMF Spring meeting, Thomas Jordan, President of the Swiss National Bank brought the first 50 Swiss franc bank note in the new design. 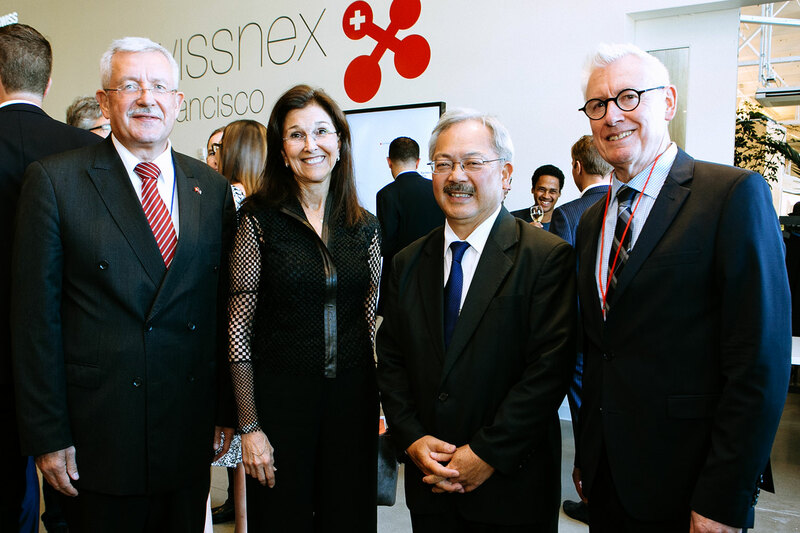 In the spotlight on the West Coast: Mayor Edwin M. Lee, Ambassador Dahinden and Consul General Hans-Ulrich Tanner celebrate the opening of Pier 17, the new home to the Swiss Consulate General in San Francisco. The Opening of the Gotthard Base Tunnel was also the main focus at this year’s Soirée Suisse. 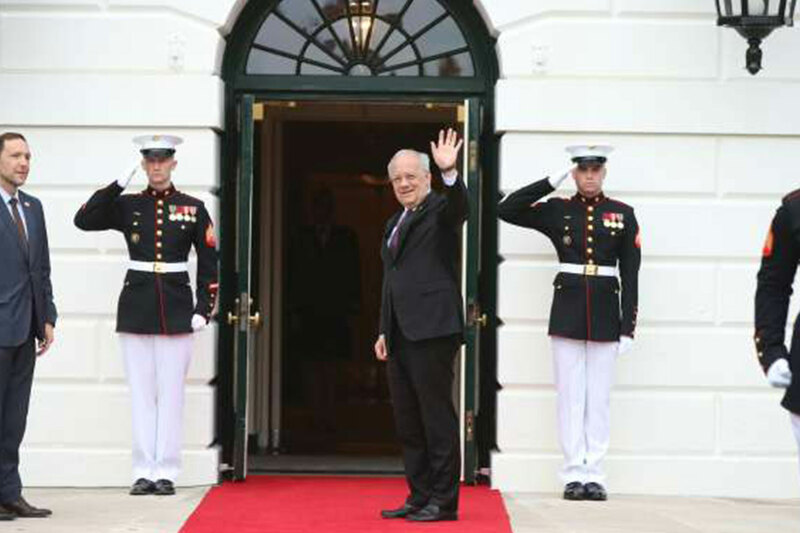 The President of the Swiss Confederation Johann Schneider-Ammann visited Washington D.C. in March to participate in the 2016 Nuclear Security Summit. 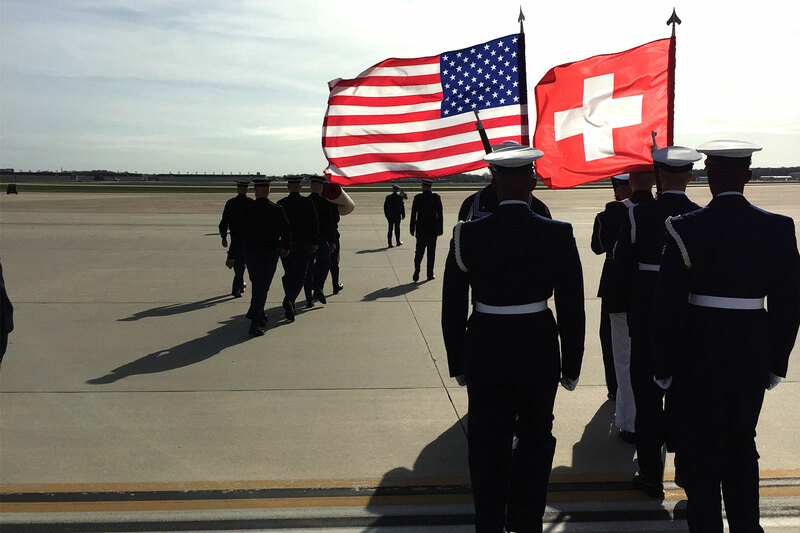 The Swiss and U.S. flags at the welcome of President of the Swiss Confederation Johann Schneider-Ammann in the United States of America. Ambassador Dahinden visits White House. Looking back at this year, who are the key people who have influenced your year 2016? Every year several members of the Swiss government visit Washington, D.C. Last spring President of the Swiss Confederation Johann N. Schneider-Ammann attended the Nuclear Security Summit, supporting the U.S. initiative to improve nuclear security worldwide. Another highlight was the visit of President of the Swiss National Council (part of the Swiss Parliament) Christa Markwalder. We had quite an extensive discussion with Speaker of the House Paul Ryan. Then I met with Secretary of Labor Tom Perez (D) several times. We have a common interest in Vocational Education and Training (VET) and even a briefing in the Senate. Swiss companies were among the pioneers in the United States. They started such programs 10, 20 years ago. In the past couple of years, there has been increasing interest in the Swiss model here in the U.S., which enhances Switzerland’s profile as a country. On a completely different note, I had the pleasure to meet former Senator Bob Dole, who ran for president in 1996. I’ve met him before, but this year he came on the occasion of the Embassy of Switzerland’s signature event, the Soirée Suisse. At 93 years old, he is an impressive man who closely follows and comments on what’s going on in the world. 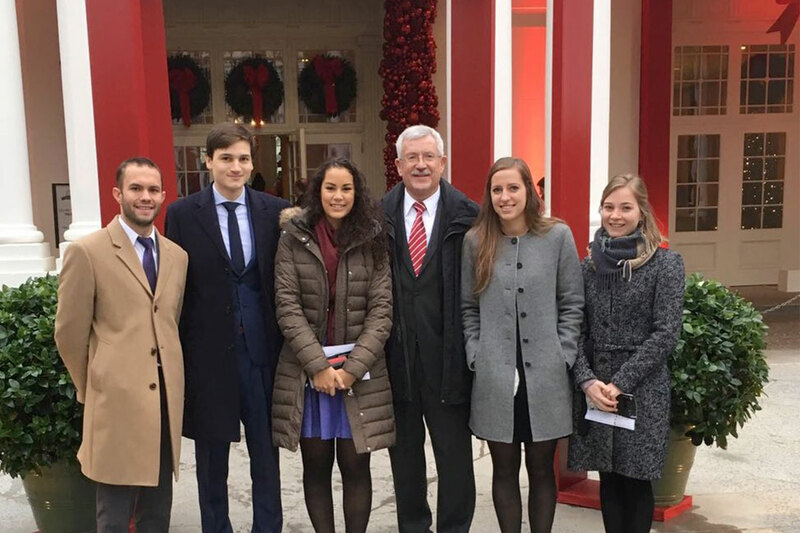 Connecting with people outside the Capital Beltway has always been a priority for you as Ambassador of Switzerland to the United States. What new areas have you discovered this year? Since I am Ambassador of Switzerland to the United States and not only to Washington, D.C., it has always been important to me to connect with the U.S. and Swiss citizens beyond the Beltway. During my first year here, I visited all the places where we have representations with professional staff. This year I had the opportunity to go beyond and to visit places I had not been to before. A highlight was my visit to Texas. No Swiss ambassador had been in the Lone Star State for eight years. Switzerland is one of the biggest investors in Texas. I am fascinated by its unique history and was very warmly welcomed by Governor Greg Abbott in Austin, as well as by the mayors of Houston, Dallas, and Fort Worth. In the many discussions I had with them and others, I could put Switzerland on the map. I also went west to more rural areas of Texas and traveled along the Rio Grande and the Mexican border, where I discovered quite a different Texas, reminding me of the many movies I saw as a boy. I’m sure I will go back to Texas. The opening of Pier 17 in San Francisco was a rare and welcome opportunity to establish a landmark. This iconic place in the old harbor area is now the common house of the Swiss Consulate General with swissnex San Francisco, the Swiss Business Hub and Switzerland Tourism. We were very happy to inaugurate this unique new West Coast location with Ed Lee, Mayor of San Francisco, and lots of attractive events. The architectural setting with the view of the Golden Gate Bridge is intriguing and–as I see it–truly reflects Swissness: very modular, sober and functional, but stylish and inviting one to think out of the box at the same time. The Embassy of Switzerland not only takes care of political and economic relations with the United States, but also promotes Swiss culture. What highlights did you experience in that area? There were many highlights. Switzerland has a very good, but quite traditional image in the United States. It’s often connected with objects such as mountains, watches, cheese, and the Swiss Army Knife. I think we need to complement this as it reflects only part of what is important and going on in Switzerland now. One of our goals is to let Americans discover the fascinating aspects of Switzerland which are still unknown. The ones that make Switzerland an economic powerhouse, a beacon of research, and one of the world’s most innovative countries. You published a book on Switzerland’s contribution to culinary history. How does that relate to your work? Food attracts almost everybody. It has played an important role in diplomacy since time immemorial. Food also characterizes a country. The Swiss are known for good chocolate and for cheese, but Swiss cuisine and Swiss contributions to culinary history go far beyond that. Before we came to the United States, my wife Anita and I asked ourselves how we could represent our country in culinary terms. Pondering and researching those issues became a fascination. I discovered an impressive abundance of forgotten stories and obscure recipes. Eventually I published a book called Schweizer Küchengeheimnisse (Swiss Kitchen Secrets)–only available in German so far. At lunches and dinners we sometimes serve historic dishes recalling famous Swiss chefs such as Oscar of the Waldorf, César Ritz, the Delmonicos, and White House Chef Henry Haller. The culinary events surrounding those stories open our guests’ eyes to lesser known aspects of Switzerland. What other events highlighted Switzerland this year? The Festival del film Locarno is one of my favorite happenings to attend in Switzerland. It is not just a festival to watch films, but it brings people together and allows for exciting discussions. For the second time, we brought movies and the spirit of Locarno to the United States with our Locarno series; this year not just to D.C., but also to Chicago and Atlanta. 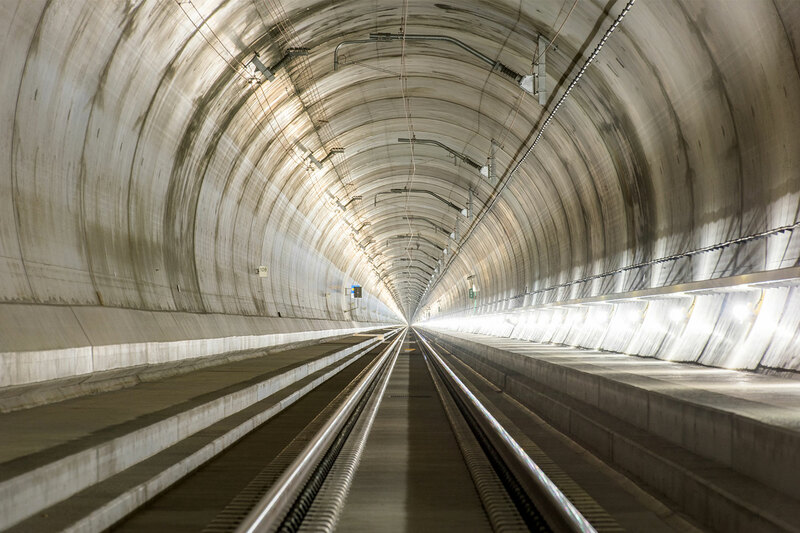 Another outstanding topic, cultural in a broader sense: the opening of the world’s deepest and longest railway tunnel: the Gotthard Base Tunnel. We had several events surrounding the tunnel and the mountain it crosses, including our signature event; the 2016 Soirée Suisse, where we linked engineering, craftsmanship, history, food, and the diverse culture of Switzerland. What’s special about the tunnel besides being the world’s longest and deepest one? It’s much more than just a hole in the mountain. I was very happy that we were able to show that the Gotthard Base Tunnel is an essential connection for Switzerland and within Europe. It connects the German-speaking part with the Italian-speaking part of Switzerland and Europe. It’s an important route for freight traffic, an attempt to shift transportation from the streets to eco-friendlier tracks. And the mountain itself has a very symbolic character since it is the origin of four major rivers in Europe. Why is it important for you to join together and to collaborate with American institutions? It is a core role of a representation and for an ambassador in particular: it is about building bridges to our host country and its culture. It is about nurturing synergies, strengthening relations, and understanding each other even better. That’s why I appreciate cooperation such as that which we have with the National Portrait Gallery. The starting point was the two paintings we have at the Swiss Residence from the American Civil War era. They are studies for a painting the Swiss government commissioned for the Swiss House of Parliament. We studied the portraits with the director of the NPG, Kim Sajet, and Chief Historian David Ward. The paintings allowed us to discover what Switzerland and the United States–the two oldest federal republics–share in terms of common values. You have a strong personal interest in humanitarian issues. Humanitarian affairs are also pivotal in Swiss foreign policy. 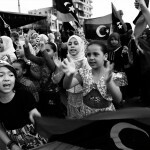 What were the significant events this year that illustrate that importance? Not only preventing conflict, but also supporting people affected by conflict has played an important role in my professional career. One could say that this is a very Swiss part of me; Switzerland is the birthplace of the Red Cross movement and it is the depositary of the Geneva Conventions. I am very personally attached to those humanitarian ideals and principles. I was very happy to have Peter Maurer, the president of the International Committee of the Red Cross, in Washington. He is a long-standing friend of mine. With him we organized an exchange with diplomats and people from think tanks and other organizations on the theme of the refugee’s situation with a focus on the Mediterranean. We also have a successful partnership with the American NGO Vital Voices. They are an excellent partner for the Embassy of Switzerland on the topic of the role of women in our world. Women are very often the most victimized group in conflicts, but also the ones who can play an outstanding role in overcoming conflict. Working on empowering and strengthening women is of the utmost importance. We jointly organized a series of six panel discussions on sexual and gender-based violence to promote innovative ideas and effective humanitarian and development solutions in that area. Switzerland’s role as protecting power for the United States in Iran had much visibility this year. What were the highlights? Early this year it was a true breakthrough when we successfully supported efforts for three American prisoners to be released in Iran. President Obama and Secretary of State John Kerry expressed their gratitude to us for our role. When I met John Kerry during the Fourth of July festivities, we spoke about international Geneva and he and his wife told me about their time in Geneva. Looking ahead to 2017, what will it bring? 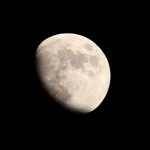 Is there anything in particular you are looking forward to? The most obvious changes are the new administration and changes in Congress. They will impact our work significantly. That being said, I do not expect any major changes in the relations between Switzerland and the United States. They are solid and have been solid for a very long time. However, many important positions will see new people and we will certainly work to build up our new relations and our network, and we will closely follow the development of new policies. Our economic relations with the U.S. are impressive. We are a strong economic partner of the U.S. Swiss companies do business across the 50 states. Switzerland is the 7th largest foreign investor in the U.S. and always among the twenty most important trading partners. Unfortunately that is not well known among the administration, Congress, and the broader public. That is something we want to change. We will continue our cooperation in the area of Vocational Education and Training. The Embassy of Switzerland’s role is to connect people and organizations, to share information about our dual education system, and about how it might be valuable to the U.S.
What’s also coming soon–and I am excited about it–is a campaign we’re launching next year. It’s hard to put it into words without revealing too much already. But the campaign will showcase and introduce Switzerland in new, yet unusual and unexpected ways with manifold activities, events, and hopefully it will bring interesting collaborations, encounters and new food for thought. So I suggest that you keep your eyes open and keep in touch with us in 2017!